When I started out in the VET sector, training videos were a part of any good trainer’s toolkit. Times have changed. Now there is YouTube where people turn to for their information or entertainment. YouTube attracts over 1.8 billion users every month – and that’s just the people who are logged in, according to Business Insider Australia. Recently I was talking to my friend Susan and she explained to me that viewing YouTube videos was a great way for her to develop new skills like changing a flat tyre and restringing roman blinds. So why don’t more food business owners and managers adopt this same approach to learning at work to reflect the way that we naturally learn at home? When it comes to food safety compliance training, it must effectively connect with your employees and this will lead to retention of important information, that could one day prevent an incident from occurring. In a recent Forbes business magazine survey sixty percent of employees indicated they prefer to ‘watch’ information in the form of a video rather than read the same information in a written format. Video influences knowledge about performing a task on a consistent basis. If you want all your employees to take food safety compliance training seriously, it must be presented in a manner that caters to their learning styles. a video will grab hold of your employees’ attention straight away. It consists of both movement and sound, it does this successfully by using voice to convey information and movement to attract attention. a video can be used to present food safety information and instructions in a simple straight forward manner. when information is presented in a straightforward way it is understood and it engages employees’ interest, this assists with learning and the retention of information. Employees can quickly pick up the required information to ensure food safety standards are being met. Increasingly we are identifying food business managers wanting people who are multi-skilled, can work in teams and take responsibility for food safety and know how to deal with problems and unforeseen incidents. There is also an acknowledgement that current training approaches are not providing the desired results and these managers now recognise the value of training videos. We work with our food industry clients to produce stand out training videos which are focused and contribute to the achievement of business goals. We discuss the outline you would like your training video to have, its components, how long you would like it to be, key areas to highlight and so on. Effective training videos tell a story to make the content engaging and memorable. The bonus is employees can view the video as many times as they need to. This also helps to ensure important key messages are presented consistently and this then translate on-the-job. For one client, our approach and video product has been acknowledged as good industry practice by a food auditing certification body, food supplier auditors and by a regulatory authority. It’s also assisted in gaining new business. 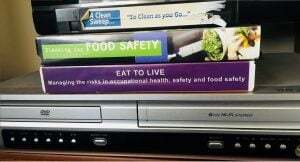 Next time you need to provide food safety training, why not consider video? After all it is one of the most cost-effective and successful methods to keeping your employees, customers and business safe.